Can We Predict When Venezuela’s Statist Nightmare Will End? Ever since 2010, I’ve been pointing out that Venezuela is a horrifying and tragic example of what happens when the private sector in a country is almost completely suffocated by excessive government. And with the country now in a death spiral, you would think it’s a perfect time for further commentary. I sometimes wonder, though, what I can write that isn’t ridiculously repetitive. But a couple of recent conversations have convinced me of the need to address two points. First, it’s important to emphasize that not all statism is created equal. When writing recently about Denmark, I created a chart to show how that country was much more pro-market than France. And that same chart showed that France was much more capitalist than Greece. And guess which country was the most statist? If you said Venezuela, you’re right. And the lesson from this data is that the degree of statism matters. 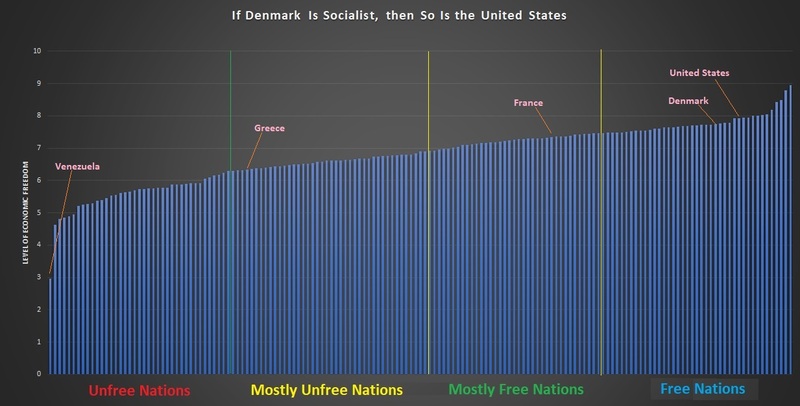 Venezuela is a total mess because of total statism, Greece is in trouble because of lots of statism, France is anemic because of run-of-the-mill statism, and Denmark does okay because it’s only statist in one area (fiscal policy). Imagine you were a teacher and these countries were students. Here are the grades you’d assign for economic policy. Second, I want to answer a question that often gets asked, which is how long can the current government survive? Unfortunately, I don’t have a good answer. That’s partly because bad policy doesn’t cause overnight collapse (Adam Smith noted more than 200 years ago, “there is great deal of ruin in a nation”). Venezuela historically has propped up its statist regime with oil revenue, but that’s shrinking as an option because of government incompetence. Thousands of workers are fleeing Venezuela’s state-owned oil company, abandoning once-coveted jobs made worthless by the worst inflation in the world. …Desperate oil workers and criminals are also stripping the oil company of vital equipment, vehicles, pumps and copper wiring, carrying off whatever they can to make money. The double drain — of people and hardware — is further crippling a company that has been teetering for years yet remains the country’s most important source of income. …Venezuela is on its knees economically, buckled by hyperinflation and a history of mismanagement. Widespread hunger, political strife, devastating shortages of medicine and an exodus of well over a million people in recent years have turned this country, once the economic envy of many of its neighbors, into a crisis. At the end of the day, the regime can rely on force. And Venezuela’s politicians cleverly have put the army in charge of graft and shakedowns, thus earning at least temporary loyalty. Venezuela’s military has come to oversee the desperate and lucrative water trade as reservoirs empty, broken pipes flood neighborhoods and overwhelmed personnel walk out. Seven major access points in the capital of 5.5 million people are now run by soldiers or police, who also took total control of all public and private water trucks. Unofficially, soldiers direct where drivers deliver — and make them give away the goods at favored addresses. President Nicolas Maduro’s autocratic regime has handed lucrative industries to the 160,000-member military as the economic collapse gathers speed, from the mineral-rich region of the Arco Minero del Orinoco to top slots at the state oil producer to increasingly precious control over food and water. Moreover, it’s difficult for people to revolt since the regime has followed the totalitarian playbook and banned private guns. So it’s no surprise that many disaffected people (the ones who otherwise might revolt) are simply escaping the country. Hundreds turn up each day, many arriving penniless and gaunt… Once they cross, many cram into public parks and plazas teeming with makeshift homeless shelters, raising concerns about drugs and crime. The lucky ones sleep in tents and line up for meals provided by soldiers — pregnant women, the disabled and families with young children are often given priority. …this is happening in Brazil, where a relentless tide of people fleeing the deepening economic crisis in Venezuela… The tens of thousands of Venezuelans who have found refuge in Brazil in recent years are walking proof of a worsening humanitarian crisis that their government claims does not exist. …more Venezuelans are leaving home each month than the 125,000 Cuban exiles who fled their homes during the 1980 Mariel boat crisis. And the ones who haven’t left still have some options besides starve or revolt. A few years ago, there were so many donkeys, or burros, in the Venezuelan state of Falcón that they were a problem — herds everywhere, causing highway crashes and blocking airport runways. But over the past three years, the herds have shrunk dramatically as thousands of burros have been slaughtered for their meat by Venezuelans suffering through a near-famine. …The collapse of the Venezuelan economy is radically changing the eating habits in the oil-producing country, where large sectors of the population are being forced to pick through garbage and slaughter domestic animals to sate their hunger. …The clandestine slaughter of the animals also has become a sanitary and environmental problem, Stefaneli added. There are no sanitary controls, and the burro has been disappearing from its native habitats. …Years back, residents of Paraguana used to eat goat, fish and beef. And when those were in short supply they ate rabbits, grains and even iguanas. Burro meat was not liked because it’s tough and smells, even from far away, according to residents who have eaten it. But it has become a necessity for many people. The bottom line is that Venezuela is in free-fall, but I don’t know where the bottom is. And I don’t know what will happen when the country hits rock bottom. But if you hold a gun to my head, I’ll predict that the regime somehow collapses in 2020. P.S. The silver lining of Venezuela’s dark cloud is that we have some grim humor from inside and outside the country. P.P.S. Venezuela is such a disaster that even the World Bank acknowledged Chile’s market-oriented system is far superior. I wonder if any of the wealthy politicians advocating socialism for America have ever tasted mouse soup? The loss of social capital becomes a self reinforcing vicious cycle. Voters who grow up in such an environment will forever flip-flop between left and right wing totalitarianism. Venezuela’s problems will not end with the inevitable death of its leftist regime. Venezuela urgently needs a counter intervention as the nation is already intervened by cubans, russians and chinese. The former being the administrator of the ongoing intervention to plunder the country.